Gillian Smith has benefited from equine therapy at The Donkey Sanctuary. A British woman has spoken out about her social anxiety issues and how equine therapy with donkeys has helped her. Animal lover Gillian Smith found coping with everyday situations challenging and stressful, particularly when meeting new people. She was introduced to The Donkey Sanctuary’s equine therapy programme by her support worker at Breakthrough UK, a Manchester-based charity which supports disabled people towards independence and employment. Gillian has been given a new-found confidence thanks to the programme of ‘life skills sessions’ at the centre in Manchester. The programme is specifically designed for vulnerable children and adults, with the aim of developing some of the key life skills as defined by the World Health Organisation, including empathy and self-esteem. Gillian’s support worker identified that the life skills programme could be just what she needed to help increase her confidence, improve her key life skills and help her become more independent. 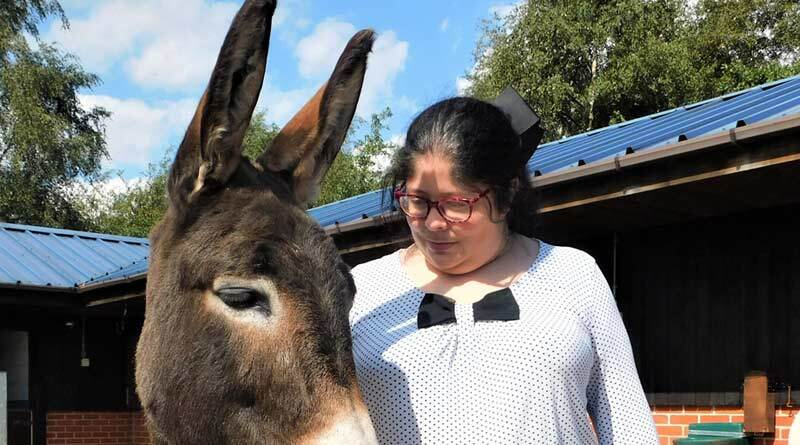 Her first challenge, however, was to overcome her nervousness of using public transport to get to the centre in Abbey Hey, but with the support from Breakthrough UK and the incentive to see the donkeys, Gillian made it safely to the sanctuary. Donkeys are social creatures and are able to pick up on the non-verbal communication of all sentient creatures that surround them, including humans, and will respond accordingly. Donkey Sanctuary staff are trained to pick up on the smallest ear or head movement that can give an indication of how the donkey is feeling and can be used to help the client see how they are impacting the donkey, so this is a type of ‘safe’ feedback system for the client. Over the eight-week donkey-facilitated learning programme, Gillian has been able to understand how her own internal emotional feelings were mirrored by the donkeys. This, in turn, allowed her confidence to grow and she was able to face the new challenges presented to her. On one occasion, Gillian helped pick the stones from the hooves of a donkey named Joey, something she would never have been able to attempt before and proving to herself she could overcome her apprehension. As it is important that the donkeys also benefit from the interactive sessions, staff always watch their behaviour to help understand how the donkey may be feeling. The donkeys choose whether they interact or not and are given the freedom to exhibit their natural behaviour. Gillian’s time spent with the donkeys and attending the sessions has made a positive impact on her life. Her confidence has increased and by pushing herself outside of her comfort zone to approach difficult and challenging situations, she has become more independent. “I’m always thinking too much and the donkeys helped me to keep calm. When you really want to do something, you have to push yourself, even when it’s difficult. I now feel happy, and the experience has given me the confidence to want to go out and do more things,” Gillian said. The Donkey Sanctuary works to transform the quality of life for donkeys, mules and people worldwide through greater understanding, collaboration and support, and by promoting lasting, mutually life-enhancing relationships. World Mental Health Day was on October 10.